When to go fishing in Mongolia? Well the absolute best time for Mongolia fishing is May, when the rivers have just thawed and the fish are ravenous. 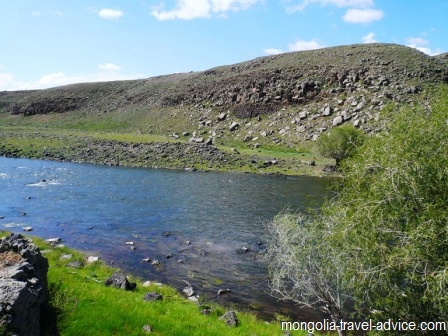 Unfortunately, however, fishing is closed to Mongolians and foreigners alike due to the breeding season. Some locals who ignore the rules inform me that the fishing is amazing, but as a foreigner it would be immoral, illegal, and asking for trouble to fish before 15 June. Mid-June is still a pretty good time to go fishing in Mongolia. The weather then is starting to warm up enough, too, but Spring is always a little unpredictable compared against Fall/Autumn. From early July, the countless summer bugs, nymphs, and other crawlies which are the lifeblood of this great fishery come out. Camp by the river and there is literally a visible band of flying insects lining the banks. You can still do reasonably well for yourself during this time, but the fish are spoiled for choice and very choosy. You can cast in the same spot 20 times and only get a fish on the last. Open their stomach and you can see why: they have already completely gorged themselves on insects. From September, things start cooling down and the bugs dissipate. The September weather is still tolerable and more stable than in June, and the fishing gets better. In October, the bugs really start disappearing and the fish get desperate to fatten up before the ice, so that's probably the best time for fishing. A number of serious anglers go fishing in Mongolia with professional outfitters in October but at that time there's snow around, the mud is starting to freeze, ice is collecting in the eddies and it's getting COLD during the day, not to mention the freezing nights. At least on a guided tour you'll have a hot meal and a fire to head back to. So you planning on when to go fishing in Mongolia you should think about the balance between catching the most fish, and being able to feel your hands after half an hour's fishing! I'd suggest September as a good compromise between comfort and fishing. The Tsuman river. Reputed to be good for Taimen, but useless when I was there; those volcanic rocks will grab onto the smallest hook. Well, first of all Mongolian fish varieties there's the spectacular Taimen. Weighing sometimes up to a whopping 120 pounds (! ), but on average a very respectable 10-12 pounds, anglers lust over the chance to have a crack at one of these. I won't drag on about Taimen because there's such a proliferation of material about them on the web. Suffice to say, Taimen are the reason Mongolia fly fishing is so popular. They are very aggressive, and make for spectacular takes, but can also be elusive when not 'on the bite'. Then there's Lenok, pretty similar to a big rainbow, these are the bread and butter of the Mongolian fishery and you'll catch more of these than anything else. They're plentiful, and quite fun to catch. Grayling are a shy school fish that spook easily, and so can be quite a challenge to stalk. If you catch one, keep casting in the same area! They school. The eastern rivers contain a kind of Asian Pike, which I don't know much about. I assume you'd need tracer to catch these. Whether to go fly fishing in Mongolia, or lure fishing, is completely up to you. They both have the same pro's and con's in Mongolia as in anywhere else in the world. Fly fishing is a challenging artform and involves spectacular takes, but can get very messy if you're a beginner, so if you don't have any experience from your home country you should probably just stick to the lures. Even if you're a beginner fly fisherman, the rivers in mongolia are so plentiful, and the Taimen so aggressive, that you'll be able to catch plenty without having to worry about the perfect cast. What a fun way to practice! Get everything you want back home, or pay a lot more for it in Ulan Bator! Basic hooks and cheap nylon line can be bought in any soum (village) but the sophisticated gear is only found at pricey stores catering to foreigners in the city. Lures: anything a big trout would take back home would be worth taking: spoons, little swimmers, etc. Also make sure you take some lures with a bit of weight in them, such as those noisy flat fish-shaped lures with a few lead balls rattling around inside: some of these rivers are big, and you need to get some casting distance. A hungry taimen will take just about any casting lure that's big, ugly and loud, so bring a variety. Poppers make for great fun when they're taking from the surface. Fly patterns: Mongolia fly fishing for Taimen usually involves the tried and tested mouse pattern. Yes, they take something the size of a mouse! Streamer patterns are also popular. For Lennok, your typical trout patterns and underwater nymphs will do the job when Mongolia fly fishing: may flies, grasshoppers, gnats, etc. Taimen fishing generally calls for an 8 to 9 weight setup (!). Lennok will be more fun if you use a 5 to 6. The usual gear, vest, floatant, fly boxes, pliers, etc. will be taken by any serious angler going fishing in Mongolia. Waders and boots are great for Mongolia fly fishing if you can take them. Heavy neoprene bottoms and seriously warm socks, gloves and thermals too if you're fishing the shoulder months. For the independent fisherman short on space, it's amazing what a Leatherman on a lanyard and a pair of old runners can do for you! Waders would be a luxury for somebody living out of a backpack, but outside July or August you'll be fishing from the bank once you feel the water temperature! Independent fisherman should consider taking a 3 piece spinning rod or a 4 or 5 piece fly rod, if you are limited for packing space. For ad hoc fishing in Mongolia i've done well with a 3-piece Shimano spinning rod with average-priced Daiwa spinning reel. All packed into a piece of pipe I rigged up, it fits right inside my backpack. It's rigged with some braided line with a 20-25 pound (about 10kg) strain and has served me well. It pays to scrupulously clean all fresh water fishing gear in soapy tap water after fishing in Mongolia before heading home to avoid upsetting customs officials in your home country. Australians and New Zealanders in particular! Return from my fishing in Mongolia page to my homepage.